Rodrigo Borgia was elected to (or bought) the papacy on August 11, 1492 and became Pope Alexander VI. He was arguably the most controversial pope in the history of the Catholic Church, and certainly one of the most fascinating figures of his time. Though the Borgias are strongly associated with Italy, the family originated in Valencia, Spain with the name de Borja. They were not royal or even aristocratic. The family made its fortune through political machinations within the Catholic Church beginning with the papacy of the first Borgia pope Callixtus III, who helped advance the career of his nephew Rodrigo. Young Rodrigo studied law in Bologna, and in 1456 his uncle Pope Cal appointed him Cardinal Deacon of St. Niccolo in Carcere. By the following year, 26 year-old Rod was also Vice-Chancellor of the Holy See and an extremely wealthy guy. Despite his high ranking in the Church, Rodrigo didn’t get around to taking Holy Orders and becoming a priest until 1468. 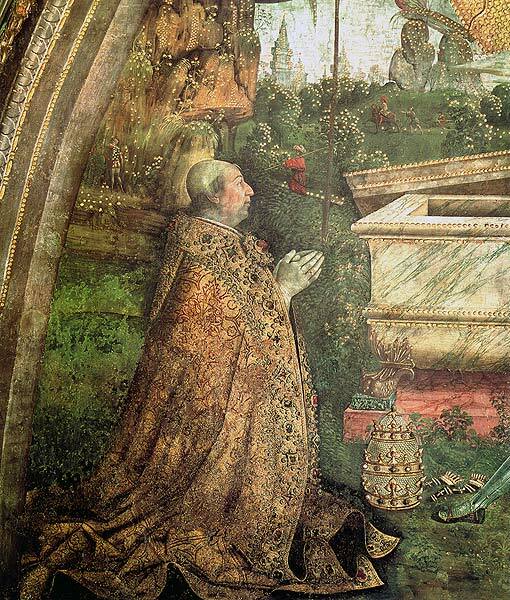 After Pope Callixtus III died in 1458, his successor Pius II also took a shine to Rodrigo. But unlike his uncle, the new Pope got on his case repeatedly about his participation in public orgies, admonishing him that it was “unseemly” behavior for a man of the cloth. At least it was unseemly for a man of the cloth to do so openly, anyway. The mother of his two most notorious offspring, Cesare and Lucrezia (he had seven children in all), was his mistress Vannozza de Cattani. He stayed with her until he became pope in 1492, when he took up with the gorgeous and much younger Giulia Farnese who was a pal of his daughter Lucrezia. The conclave that elected the new Pope Alexander VI did so with a little encouragement from the new pontiff himself in the way of bribes and other questionable methods one might not expect from the Bishop of Rome. Nepotism was one of the perks of being Il Papa, and he named both his 18 year-old son Cesare and his mistress’s brother Alessandro Farnese as cardinals. The pope also got busy wheeling and dealing the best possible marriage arrangement for Lucrezia. He settled upon the nephew of the Duke of Milan, Giovanni Sforza, and the couple married in 1493. He would do quite nicely for a first husband, at least for a while. The pope set up other politically advantageous nuptials for his other kids, marrying his son Juan, Duke of Gandia in Spain, to King Ferdinand VI of Castile’s cousin, and his younger son to the granddaughter to the king of Naples, Sancia. By the turn of the century, Lucrezia’s husband Giovanni Sforza turned up dead at the papal palace (just one of the murders linked to the Borgias,) and Cesare was no longer a cardinal. The shenanigans such as licentiousness, violence and corruption had reached a fever pitch, garnering Pope Alexander a host of enemies. In August 1503, Alexander died at the age of 73 after dining at Cardinal Adrian Corneto’s villa. Some suggest his demise was the result of his cup being poisoned by his son Cesare. Whether Alexander was poisoned by accident or design (the cup may have been intended for Corneto) – or if it happened at all – is still up for debate. This paragraph reveals the author’s ignorance of the Sacrament of Holy Orders within the Catholic Church — and her failure to perform the necessary research on the subject before writing her article. First, a Catholic does not “take” Holy Orders, but “receives” them — using our modern connotation of those two words (which indicate an active grasping [take] versus a passive acceptance [receive]). The same is true of Holy Communion, which a Catholic “receives,” rather than “takes” (using 21st-Century language). Second, Rodrigo Borgia DID receive the Sacrament of Holy Orders long before being ordained as a priest in 1468. As the author stated, he was appointed as a “Cardinal Deacon” in 1456, the very year in which he had been ORDAINED as a Deacon. Within the original Christian Church (today identified with Catholicism and Eastern Orthodoxy), there are three major degrees of Holy Orders — the diaconate [becoming a Deacon], the presbyterate [Priest], and the episcopacy [Bishop]. Contrary to what the author thought, it was not abnormal for Deacon Rodrigo Borgia not to become a priest for an extended period of time after having become a deacon. In our own time (beginning in the mid-1960s), the old practice of a “permanent diaconate” has been restored. There are tens of thousands of ordained, “permanent deacons” in the Catholic Church — the majority of them being married men. The vast majority of them never become priests, but some of them, after becoming widowers, are invited by their bishops to consider becoming priests.